Born Sharon Lee Backof, Sharon graduated from Parkville Senior High School in 1970, and attended University of Maryland, Baltimore County during the late '70s while employed as Administrative Aide to the Dean of the School of Social Work and Community Planning at the UMAB Professional Schools in downtown Baltimore. Throughout her life, Sharon has been employed as various flavors of secretary, as well as advertising copywriter, call-in talk hostess, nightside news copy editor, freelance reporter, photographer, book reviewer, and deliverer of tractor trailers. Beginning in August 1997, she served three years as the executive director of Science Fiction and Fantasy Writers of America, and was subsequently elected vice president, then president of that organization. Sharon's first professional fiction publication was "A Matter of Ceremony," Amazing Stories, 1980. 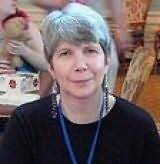 In addition to her contributions to the Liaden Universe, she has written two Maine-based mystery novels Barnburner and Gunshy, published by SRM Publisher, Ltdand more than a dozen short stories. Sharon Lee and Steve Miller were married in 1980. In 1988, they relocated to Central Maine.